Mackay’s premier venue for conferences, exhibitions, seminars and performances. The Mackay Entertainment and Convention Centre (MECC) is located in the heart of the City and is just a short stroll away from a plethora of restaurants, an award-winning Regional Art Gallery, shopping precincts and the magnificent blue water Pioneer River. 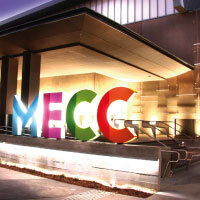 For a full list of current performances on show at the MECC, visit www.mackayecc.com.au.